Hello and welcome to the 298th installment of the SWD. Syrian War Daily is looking for individuals willing to contribute to the project. If you are interested in contributing, please fill out the form on this page. Left over Islamic State’s improvised explosive device killed two civilians in Saif al-Dawla street of the city of Raqqa. 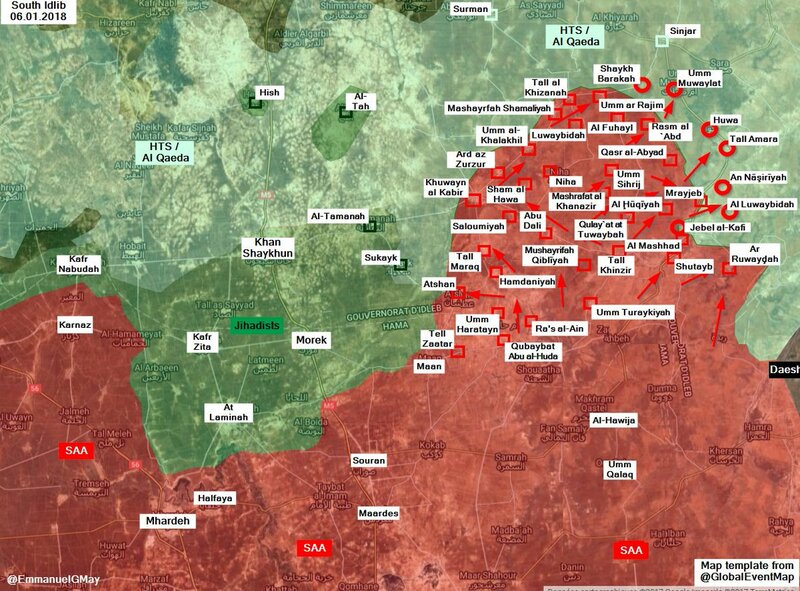 Syrian Arab Army reportedly captured Al-Luwaybidah al-Sharqiyah, Al-Nasiriyah, Tell Amara, Huwa, Umm Muwailat, Sarja, Umm al-Halahil, Kafraya and Sheikh Barakah from the rebel factions in the southern Idlib. Hayat Tahrir al-Sham stormed the villages of Farkya and Maghara, in search for the former commander of the Free Syrian Army’s Syrian Revolutionaries Front, known as Al-Hajal. Al-Hajal is being accused by the Hayat Tahrir al-Sham of harboring several wanted individuals, including an individual that is being accused of killing two people. Al-Hajal was previously detained by the Hayat Tahrir al-Sham for over a year, due to his allegiance to the Syrian Revolutionaries Front. Syrian Salvation Government, which operates in Hayat Tahrir al-Sham-held areas, issued a decision to close Free Aleppo University-affiliated institutions in the city of Al-Dana. The decision to close the institutions originated from Dr. Ibrahim al-Hamoud, who was appointed as the president of the Free Aleppo University by the Syrian Salvation Government. Syrian Interim Government’s Minister of Higher Education, Abdul Aziz al-Deghaim stated that the Syrian Salvation Government is trying to forcefully impose Dr. Ibrahim al-Hamoud as the president of the university, after closing the office of the higher education in Idlib. Hayat Tahrir al-Sham reportedly opened fire on the students in front of the closed institutions in Al-Dana, who were protesting against the Syrian Salvation Government’s decision. Syrian Democratic Forces clashed with the Islamic State at the outskirts of Al-Kushkiyah village in the eastern Deir al-Zour. According to the Islamic State’s Amaq Agency, seven elements of the Syrian Democratic Forces were killed in the clashes around Al-Kushkiyah, and additional two killed by IS’ snipers in the same area. Islamic State’s Amaq Agency reported targeting of a group of Syrian Arab Army’s soldiers with an anti-tank guided missile near the village of Al-Ramadi, north of Al-Bukamal (Albu Kamal). 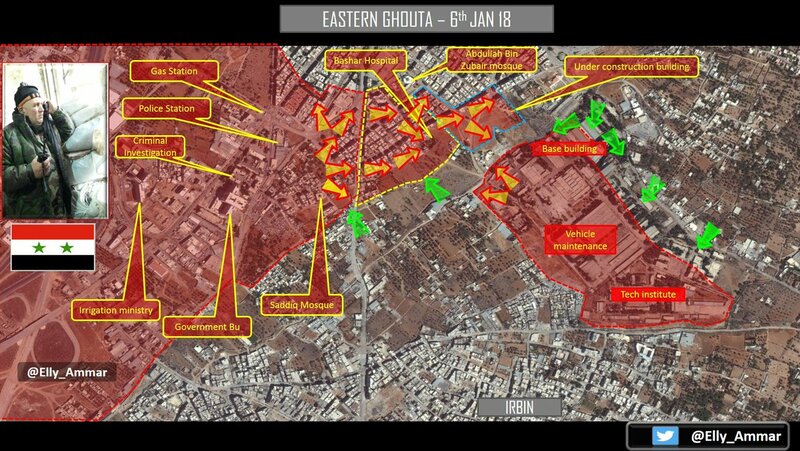 Syrian Arab Army’s artillery and Syrian Arab Air Force targeted Harasta and Mesraba in the East Ghouta. According to the Syrian Civil Defense (The White Helmets), ten civilians were wounded by the targeting of the two aforementioned localities. Rebel forces shelled Harasta and Al-Duwaileah area, at the outskirts of Damascus city. According to the Syrian Arab News Agency, two civilians were wounded by the shelling of the two areas, as well as significant material damage caused. Syrian Arab Army made limited advances in Harasta against the Ahrar al-Sham-led rebels. Reports suggest that the Syrian Arab Army captured Al-Anam building and its surroundings. Two Hayat Tahrir al-Sham’s figures, Abu Talal al-Qabuni and his deputy Abu Muhammad al-Tahoun, were killed today in the clashes with the Syrian Arab Army in the vicinity of the ‘Army Armored Vehicle Base’. Syrian government’s National Reconciliation Committee reportedly reached an agreement with the Islamic State, regarding the evacuation of several latter’s elements from Al-Hajar al-Aswad, south of Damascus. According to the reports, six fighters of the Islamic State and three civilians left Al-Hajar al-Aswad through the Maemal Barada checkpoint, located between Al-Hajar al-Aswad and Sbeneh. The individuals are reportedly being evacuated to the city of Idlib, through a checkpoint in Qalaat al-Madiq, northwestern Hama governorate. Islamic State assassinated two elements of the Iraqi National Intelligence Service in Sumer district of the city of Mosul, according to the Amaq Agency. Islamic State raided Al-Hashd al-Shaabi (Popular Mobilization Units) positions near the village of Al-Hakna, south of Al-Shirqat. According to the Islamic State’s Amaq Agency, two elements of Al-Hashd al-Shaabi were killed in the raid. Islamic Emirate of Afghanistan (Taliban) raided Afghan Local Police’s checkpoint in Imam Sahib district, killing one policeman. Similarly, Islamic Emirate of Afghanistan ambushed an element of the Afghan National Police in Ali Abad district, killing him and seizing his assault rifle. Afghan National Security Forces conducted operations against the Islamic State in Nouram Valley of Alingar district. According to the Afghan Ministry of Defense, 20 fighters of the Islamic State were killed in the operations. Afghan National Security Forces killed two fighters of the Islamic State in Achin district. Islamic State assassinated an element of the Islamic Emirate of Afghanistan’s Shura council. The incident occurred in Jamtla area. Islamic Emirate of Afghanistan raided Afghan National Army’s positions in the city of Pol-e Alam, capital of Logar Province. The raids reportedly resulted in destruction of three vehicles and unknown number of casualties among the army’s ranks. Islamic Emirate of Afghanistan’s improvised explosive device targeted Afghan National Army’s foot patrol in Sabari district, killing five soldiers. Islamic Emirate of Afghanistan assassinated an officer of the National Directorate of Security in Sabari district. Islamic Emirate of Afghanistan captured Afghan National Army’s checkpoint in Abgarmak area of Ghormach district, killing one and wounding two soldiers in the process. Islamic Emirate of Afghanistan seized a PK machine gun from the checkpoint. Islamic Emirate of Afghanistan’s sniper targeted Afghan National Army’s checkpoint in the city of Ghazni, killing one soldier. Afghan National Security Forces killed three fighters of the Islamic Emirate of Afghanistan and destroyed two vehicles in Urgun district. Islamic Emirate of Afghanistan assassinated Afghan Local Police’s commander Hazrat in the city of Sharana, capital of Paktika Province. Islamic Emirate of Afghanistan’s improvised explosive device targeted Afghan National Army’s tank in Gerani area of Bala Buluk district. The explosion killed three elements and wounded two, including ANA’s commander Abdul Ahad. Afghan National Security Forces conducted operations against the Islamic Emirate of Afghanistan in the province, killing ten and wounding nine elements of the group. Furthermore, several weapons depots and ammunition caches were destroyed during the operations. Islamic Emirate of Afghanistan repelled Afghan National Security Forces’ attack in Landi Kusi area of the city of Tarinkot, capital of Urozgan Province. According to the Islamic Emirate of Afghanistan, three armored personnel carriers were destroyed in the failed attack. Islamic Emirate of Afghanistan ambushed Afghan National Security Forces’ convoy on Tarinkot road, coming from Kandahar Province towards the city of Tarinkot. Islamic Emirate of Afghanistan reportedly destroyed an armored personnel carrier, a tank, and a pickup, as well as killed at least six elements of the Afghan National Security Forces in the ambush. Islamic Emirate of Afghanistan seized four assault rifles and a PK machine gun. Islamic Emirate of Afghanistan’s improvised explosive device destroyed Afghan National Security Forces’ armored personnel carrier during the clashes between the two in Kharjoy area of the city of Qalati Ghilji, capital of Zabul Province. Islamic Emirate of Afghanistan reportedly downed Afghan Air Force’s helicopter in Haji Wali area of Delaram district, allegedly killing everyone on board. Afghan National Security Forces killed four fighters of the Islamic Emirate of Afghanistan and destroyed a vehicle in Nahri Saraj district. Two elements of the Afghan National Police defected to the Islamic Emirate of Afghanistan in Dorahi area of Nad Ali district. The defected elements handed over two PK machine guns to the Islamic Emirate of Afghanistan. Islamic Emirate of Afghanistan’s improvised explosive device destroyed Afghan National Police’s armored personnel carrier near Qari area of Nad Ali district. Islamic Emirate of Afghanistan’s improvised explosive device destroyed Afghan National Security Forces’ vehicle in the vicinity of Baba Sahib Zayarat area of Arghandab district. The explosion reportedly killed and wounded five elements of the Afghan National Security Forces.